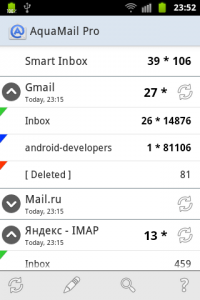 Not everyone likes Android’s native email client. For some people, Gmail is not the final solution, as it has some limitations that are not found in other email clients. Currently, there are many of them available on the market, both free and paid. 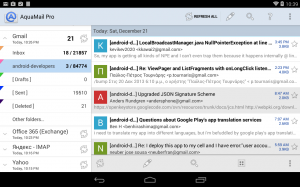 Mail Aqua is one of the best currently available, with a free version and a premium one. Among its greatest features is the ability to manage multiple accounts and to set separate settings for the different modes. This is a very interesting feature as it allows having different configurations depending if you are using Wi-Fi or mobile data. So we can take better advantage of the Wi-Fi network with constant updates or download attachments and save data or images restricting benefits when there is no Wi-Fi network. In addition, we also have night settings to limit notifications and warnings during that time. 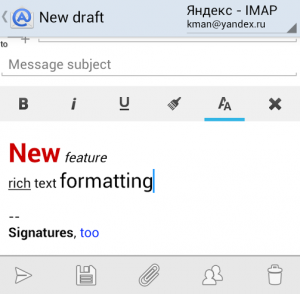 Besides the usual benefits of any email client, Aqua Mail allows us to compose messages with rich text formatting, giving greater customization to outgoing messages. Aqua Mail configuration is easy and automatic with popular mail servers, like Gmail, Yahoo, Hotmail, FastMail, Apple mail services, GMX and AOL among others. In addition, it is compatible with any mail server using standard protocols IMAP, POP3, SMTP and EWS. If we use an alerts or notifications service, such as Tasker or Lightflow, Aqua Mail integrates easily with these services. The free version allows up to two different accounts, but it doesn’t include any alias and add a promotional signature to outgoing messages, with a link to the developer’s website. If we use more than one account, we can enjoy the possibilities offered by the alias and forget promotional signatures. We can get the Premium version for $4.95.